Wash the salads and cut (tear) into large pieces of roughly the same size, and place in a salad bowl. Cut the potatoes in eight pieces and add to the salad. Peel the pear and slice it up, and cut the cheese in pieces. Add them to the salad. Prepare the salad dressing and pour it in the salad. 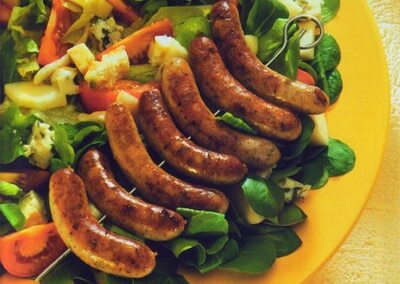 Fry the bratwurst for about 6 minutes until you get a crispy brownish crust and serve with the salad.